Did you say, Yes !! SocialChamps is spreading the Love this season with a Social Media Campaign – “Valentine Thoda Hatke” – Celebrate this Valentine in Filmi Isshtyle; Thoda Hatke with us. You can wish your best friend with a “Movie Title” name BUT you would need to change a word with your FREIND’s NAME. Isn’t is interesting ?? 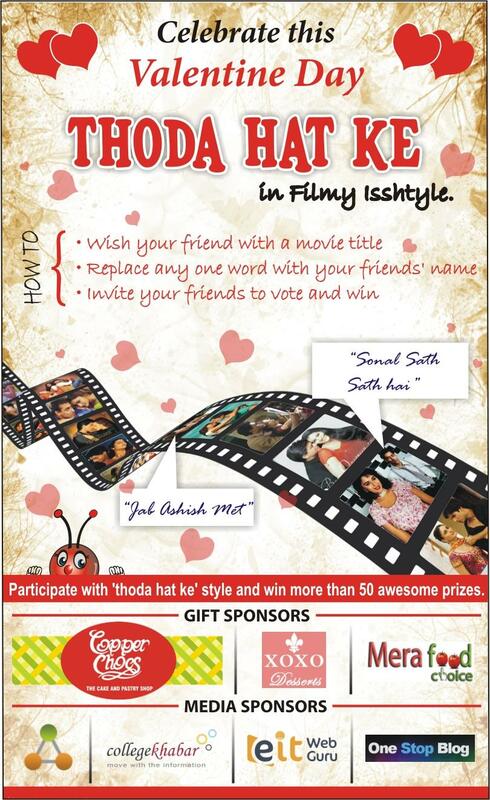 So use your creative brains and express your emotions for your friends.. and win exciting prizes. Thanks to our beloved sponsors as there are more than 50 Prizes to give away. The contest is sponsored by multiple companies to give gifts to winners. More than 50 gifts will be given out. Copper Chocs: With more than 12 outlets in Pune, CopperChocs is Copper Chocs is known for it excellence & exquisiteness. Its all about celebrations and happiness. XOXO Deserts: XOXO stands for Hugs and Kisses and is named after what the delicious desserts embody – Love, Happiness and Celebration! XOXO Desserts is pleasing the residents of Mumbai and Pune with a delightful collection of delicate, luxurious desserts, cupcakes and cookies. Mera Food Choice: Mera Food Choice is a one stop shop for travelers to order food of their interest. They have made tie up with various food providers and outlets so as to make a chain link all over India. Thus it will make easy to get food of choice at the projected/tasked place, be whether via Train, Road or be at office,garden or at home. Few bloggers and communities have also joined the league and they will be doing the active promotions of the contest with their communities. CollegeKhabar, eItWebGuru, Sitemarks and One Stop Blog are the media sponsors to spread the word. Apart from that many other bloggers are also sharing and writing about this contest. One person can upload multiple entries, however, he will be entitled to get only one prize in case of winning. In the Program the participants are required to write a Movie Title to wish their best friend and submit it along with their name, email Id and City. It is the participant’s responsibility to ensure that their personal details provided are accurate in order to be able to receive the information/notification about winning from the Company in time. The Company will not be responsible for any loss or delay in delivery of communication due to incomplete/ incorrect address provided by the selected participants, technological failure, or for the fault of third party responsible for such intimation. The participant must read and abide by all the terms and conditions before taking part in the contest. The participation in the Contest shall imply that participant has read through and agreed to adhere to the terms and conditions and be bound by them and that his/her participation in the contest is at the participant’s sole risk and is governed by the terms and conditions herein. Any non-compliance in adhering to the terms and conditions will lead to rejection of the application by SocialChamps. All disputes are subject to the exclusive jurisdiction of Courts of Pune alone.